Due to the lack of commitment on the part of the concerned agencies to produce reading materials in accessible formats, the visually impaired people in Bhutan still do not have access to public libraries and other resources. As of now, we are able to access only the free materials published online such as news articles and stories. The major publications such as books, magazines and research articles are beyond our reach. Forget about having the library books and other publications in accessible formats, we don’t even have enough textbooks that are accessible for the students especially those studying in higher secondary schools and university colleges. The publishers are too concerned about the copyrights that they are not willing to share the electronic version of their publications with the visually impaired readers. A library is the most popular source of information and knowledge but without accessible materials available, there is no way a visually impaired person can access it. However, it seems this dark era is soon going to fade out for the visually impaired community in Bhutan. There is a good news coming on the way for those visually impaired people who love reading books. The mobile application called Read for the Blind has been developed and piloted in Thailand that facilitates the creation of an audio library collection for the visually impaired readers. The concept behind this mobile application is simple. The sighted volunteers get the opportunity to read books, record it and upload it onto the server using the App and the visually impaired readers on the other end can easily access the audio books either directly through the App or through the dial-in system. The App requires two servers: one that stores the audio materials while the dial-in server facilitates access to the materials by dialing a hotline number from a telephone or a mobile phone. The audio materials are in daisy format and it enables the listeners to either rewind or forward the track while listening, or even continue from certain chapters. This innovation has been found very effective and useful in Thailand with a large number of sighted volunteers registering to read books for the blind. As a result, the audio library in Thailand now has a collection of over 18,000 books within just four years of the launch of the App. 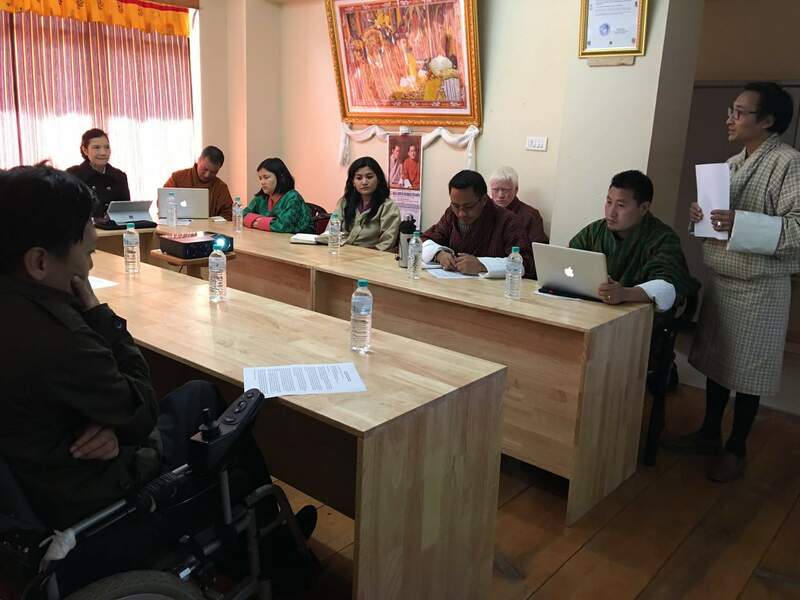 The news of this noble initiative was shared by two passionate Thai volunteers, Mr. Natwud and his wife during the consultative meeting held in the office of Disabled Persons’ Association of Bhutan (DPAB) on Monday, 6th March 2017. It is exciting to know that the Read for the Blind App is going to be replicated in Bhutan as well to enable the visually impaired people to access library books and magazines like any other sighted person. Mr. Natwud who was the key developer of the App has committed to support the launch of the App in Bhutan and he has already talked with relevant agencies in Thailand to implement this project in Bhutan. Led by Loden Foundation and supported by DPAB, a working committee has already been formed to explore ways and means to set up the infrastructures for the project. It is expected to take at least six months to have the system in place. Once completed, the visually impaired readers can access a huge collection of audio books and audio materials recorded by hundreds of sighted volunteers. I am sure most of our sighted friends would come forward to read the books for us through this fantastic App and help us create a rich audio library. Although the project is expected to benefit many of us within the blind community, I know we still have to overcome a series of challenges. The copyright issues would definitely come up because I am sure many publishers would oppose to the reproduction of their properties in alternative formats. But with time, I think we should face the reality and try to see things beyond our boundaries. How long can the blind readers be deprived of the opportunity to access books and other reading materials just because of their disability? In Thailand, I have been told that their copyright laws have been amended two years ago to allow the reproduction of published materials in accessible formats for the blind readers. I think even in Bhutan, we should exempt the reproduction of such materials from the copyright laws so that the blind readers will also have equal access to the reading materials. Another good news in Thailand is that the hotline number the blind readers dial to listen to the audio books is absolutely free. But I am not sure how that facility can be provided free of cost in Bhutan. I feel Bhutan Telecom and Tashi Cell should be able to do it as part of their social and corporate responsibility because it is going to benefit a lot of visually impaired people. I am hopeful that all the stakeholders would be able to see the world through us and help us realize our dreams. I strongly feel that we the visually impaired people should no longer be denied the right to read what others are reading. I hope this project would receive full support from all the concerned agencies. For the first time in my life, I can feel the excitement of listening to the audio books which otherwise have been lying in inaccessible hardcopies on the library shelves for years. I am sure the introduction of this App would promote the reading culture among the visually impaired people. Thanks to Loden Foundation and the two consultants from Thailand for initiating such a noble project in Bhutan. Thank you, Mr. Natwud and Ms. Nerissa for coming all the way from Thailand at your own expense just to help us see the world through books. I look forward to the successful completion of the project soon. I went through your article regarding the Audio book for the blind people of Bhutan and was found amazing. You have wonderfully written. The two poiners from Thailand who initiated the project with the help from Laden Foundation and other relevant agencies will surely benefit our visually impaired people in Bhutan like in Thailand or other developed countries. I wish every success that largely benefit the much needed section of our society from the Project.